Patient care is optimized when cytopathologists communicate their diagnostic findings effectively to clinicians and intelligibly to patients. A systematic reporting system that includes guidelines is an effective approach to this objective and represents a valiant effort to transfer valid information with clarity. Collaborative academic institutions have addressed reporting systems and guidelines for the uterine cervix, thyroid, salivary glands, pancreaticobiliary system and urine cytology. Interwoven is information that will address professional practice gaps in current cytopathology procedures, adjunctive and molecular/genetic techniques and focus issues that will enhance community and academic practices. 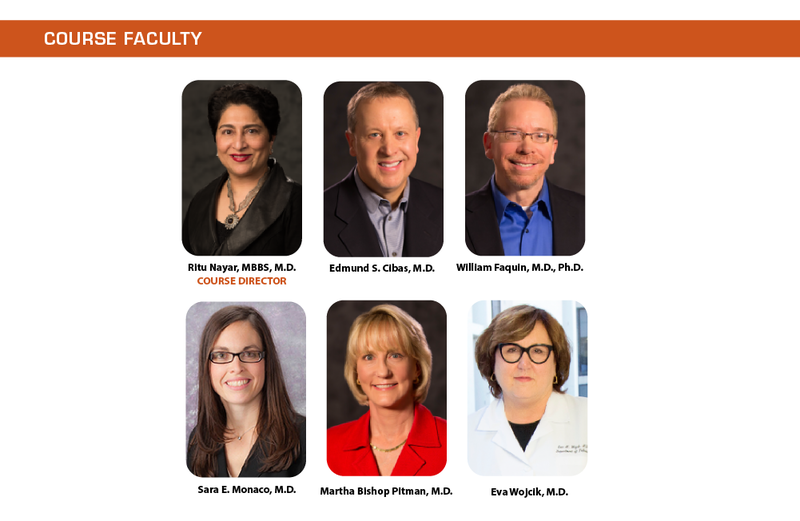 The following faculty reported no relevant financial relationships:  Edmund S. Cibas, M.D., Ritu Nayar, MBBS, M.D., William Faquin, M.D., Ph.D., Martha Bishop Pitman, M.D., Eva Wojcik, M.D., and Sara E. Monaco, M.D. Purchase the entire 2017 Diagnostic Cytopathology course and get a great discount!